We’re beginning to realise that planning the daily activities for this trip is a previously unknown combination (to us) of dote friendly activities, snack breaks and using google to make sure everything is within easy walking distance (with public transport options if little legs get tired), all beneath the looming cloud that this planning may go up in smoke for any number of dote related reasons. This holiday is going to be all about Lil’ D, though with any luck we adults will enjoy it too. On past holidays Bear has done an excellent job of creating an itinerary that we tend to use as a strong guideline when we get to our destination. Not so, we suspect, when travelling with dotes. Should our idea of fun be diametrically opposed to that of Lil D we have a safety net in place. 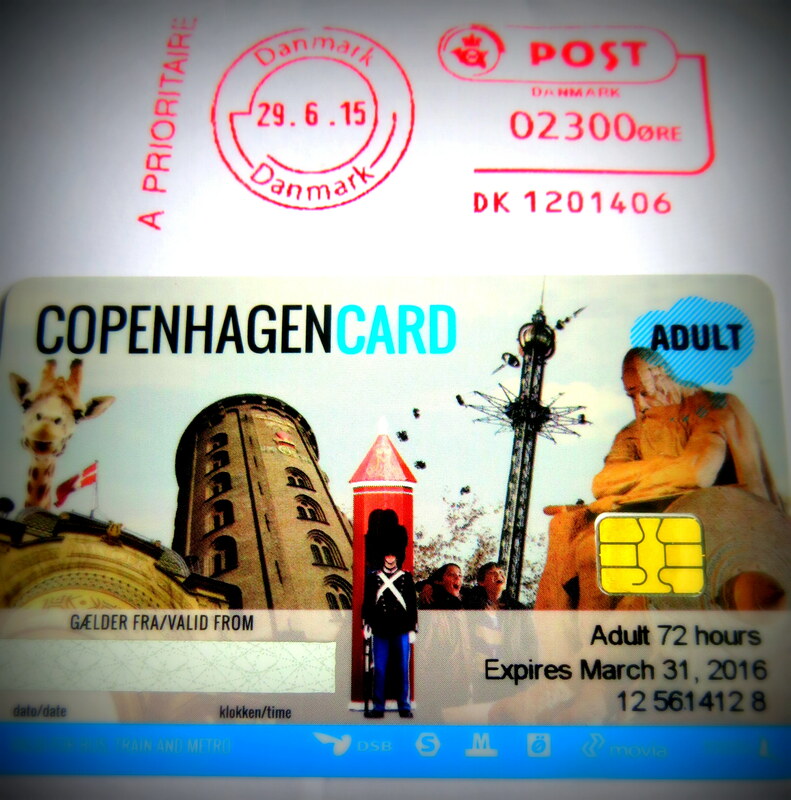 We have prepurchased ourselves some Copenhagen cards that will gain us free entry to 74 museums and attractions, free transport and other assorted discounts. Lil D goes free with one adult card. The card costs €79 for 72 hours and will hopefully prove convenient. I’m always looking for a reason to use my Chambord. I love it; it’s always somewhere in the house and when you’re celebrating a certain auntie’s recent career success, it’s a perfect addition for prosecco cheers. But it always makes me wonder what else I can use it for. It’s delicious on vanilla ice cream but after that I get stumped. Til now. 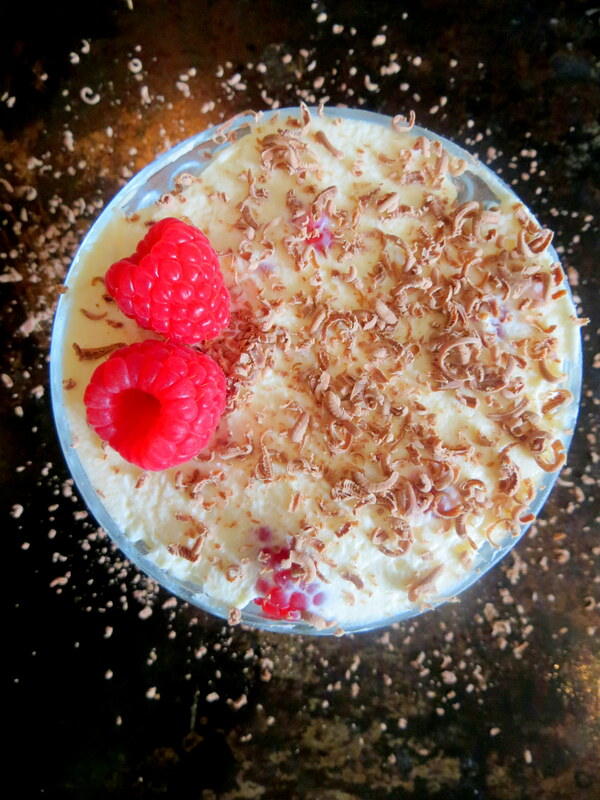 We have a new favourite ⇑ Raspberry tiramisu. The recipe goes something like this. Imagine a regular tiramisu and substitute anything coffee for raspberry. A proper tiramisu should have eggs but when you decide to make it the morning of, a mix of mascarpone and cream’ll do it. Then leave it in the fridge as long as you possibly can without diving in. Start by combining your mascarpone with the vanilla and sugar. In a separate bowl whip up your cream til thick then slowly combine with your mascarpone mix. Layer with raspberries, the mascarpone mix, another round of chambord soaked ladyfingers and then back to the raspberries and top it off with the rest of the mascarpone. Then refrigerate. Most recipes say overnight but we didn’t start in time so in the end we managed 6 hours. In an all fronts attack, books have been purchased. No child left behind. Read, you must! With suggestions from the Book Trust,The Guardian Children’s book site and our very own librarian auntie we’ve come up with a book list to try and catch our dote’s imagination and inspire her confidence. First up, Rainbow Magic Pop star Fairies. 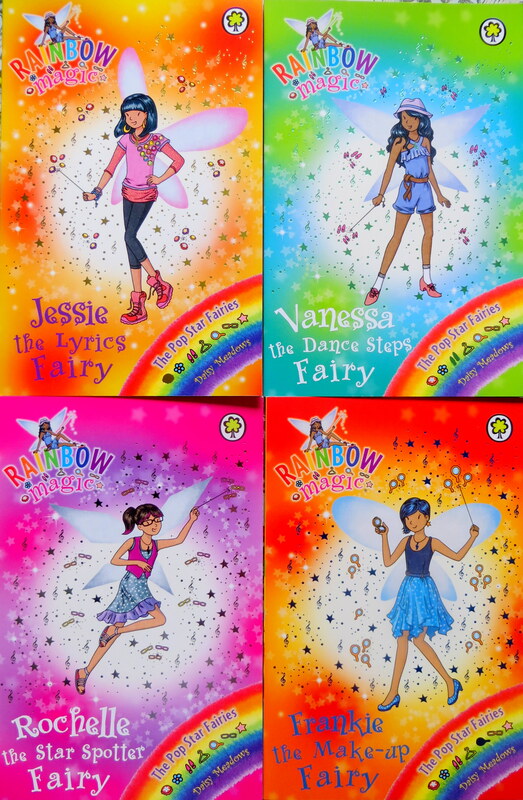 Part of a huge collection of Rainbow Magic Fairies by Daisy Meadows. Lil D was delighted with our in-house fairy and music is her thing, so Pop stars+Fairies=Success? Initial excitement waned a little when we suggested she should read the books to us. Chapter book fear remains intact so whilst we concentrate on song lyrics, more books are being added to baskets. Next comes Horrid Henry, a Pound Shop find that seems very gentle. But will it be girly enough? I’ll send it to D-Daddy for appraisal. A little more post won’t hurt. And now my favourites have arrived. Lil D can be a little sketchy on her phonics. 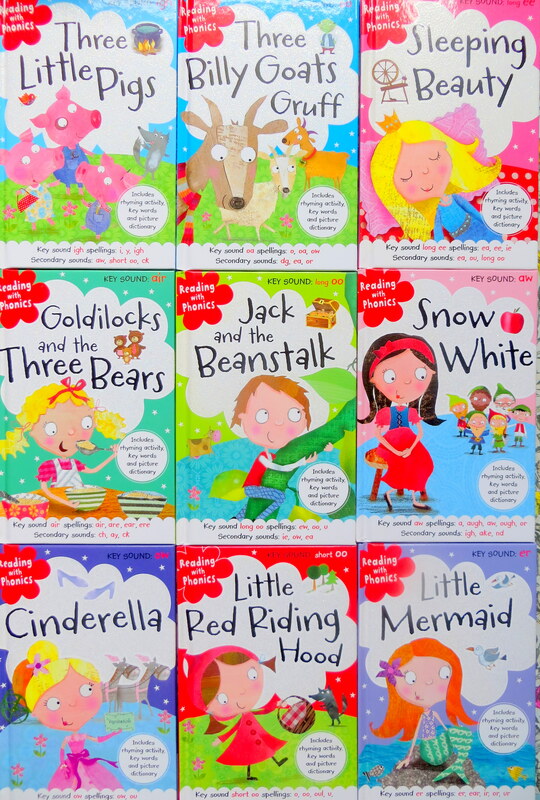 New words can flummox her and she doesn’t know where to start but with these fabulous fairy tales key sounds are practiced and reinforced with rhyming words. Plus they are Cuuuute. Oh the fear. Low blood sugar related grumpiness. A tired dote who doesn’t want to go any further. Being out of time or out of options to stop and eat or worse still, unfamiliar “gross” food. With an early start, a bus trip, an airport wait, a flight and then a train ride the opportunities for frustrations, fatigue, hunger and grumpiness are many and varied. Hopefully, with a bit of planning we can lessen these odds. We know from experience English breakfast tea is in short supply when in Copenhagen so that’s a definite packing must. We also like to travel with extended snackage, i.e. not just for the flight, so further thought is required. Making sure we start with familiar food when we arrive is also high on our list of to-dos. Breakfast is included at the hotel so we will start our days well but out and about the whims of a dote need to be curtailed. Research, research, research. It seems like a constant task since we started on this path and internet, you have been less than helpful. When you google travel snacks, or snack packs it’s the same list of 10 foods that seem a bit of a stretch for dote purposes. 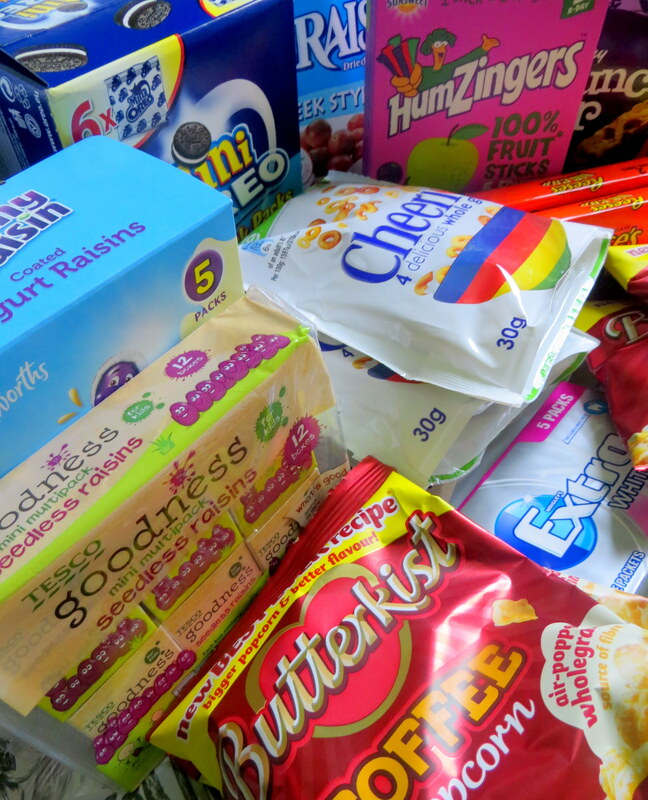 True we want our snacks to be energy fueled, sustaining and generally not sweets. Sugar rushes won’t make the days easier. But I can’t see me packing peanut butter and hummus. We are trying to travel light here. Ziplock bags. That’s what I foresee. Cheerios, popcorn, grapes, raisins, cereal bars, yoghurt covered cranberries and Lil D’s favourite, chewing gum. D’ya think we have enough? It’s Sunday afternoon. A time, for these aunties at least, to relax. 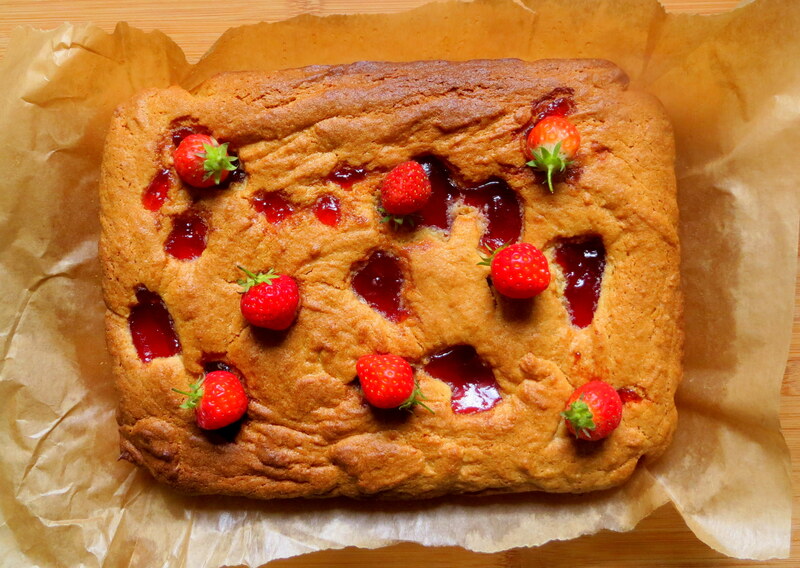 The mind, and belly, inevitably turns to dessert… except there is nothing appealingly sweet in the house and very few ingredients for my tried and tested recipes. Well, a quick google and a long rummage through the larder brings me to this recipe. The verdict? Perfect with a cup of tea. It’s been a busy week at Dote Central. All the dotes have finished school for the summer – and so have I (^-^) Lil GN and Lil C are off on their holidays and Lil D is spending her first few days of summer at nanny’s. This summer for Lil D is a summer of reading. In amongst the fun, the play and the dancing we’re crowbarring in 10 minute segments of reading and word recognition to build her confidence and interest in reading. Lucky you, Lil D! These first few days I’ve been spending some time listening to her read and watching how she learns. She’s like me – she works best when stationery is involved. Surrounded by highlighters, scissors and checklists, being active made it fun for her. She learns through watching and trying, so in terms of reading, activities like cutting up words, highlighting the easy from the more challenging and learning from listening and repeating are really good for her. Rewards have been very successful too. A scratchcard points card counted down the 10 minutes of reading she racked up each day with the agreed upon goal of an ice cream sundae (on Friday) as motivation. Reading the same books to me, nanny and then papa gave her routine, confidence and reinforcement where chapter books seemed to overwhelm her. Then genius struck. The dote loves music. She’s called Lil Dancer for a reason. Reading the lyrics of songs she likes is our newest way of squeezing in a bit more reading practice and checking off another 10 minute goal. So far we’ve read, practiced and performed Katy Perry’s Firework and the Abba classic Mamma Mia to rapturous applause. We read through the words together first, listen to the song then try to sing along with our words. She loves learning together rather than all the focus being on her. And it works. She’s worked hard at it and for much longer than the 10 minutes she needs to count towards her reward. She took so much pleasure in reaching her goal and making her sundae as indulgent as she could. Our summer of reading looks promising. And to build on what we’ve started I’ve made up a few reading packs to be sent to her house this week. Not only can I give her the joy of mail but each pack has a sound for the day to practice, a song to read and a postcard explaining what she needs to do. I’ll mix it up a bit with word sorting activities and other games. Hopefully a phone call a day can keep her on track and that by the end of the summer chapter books won’t hold so much fear.